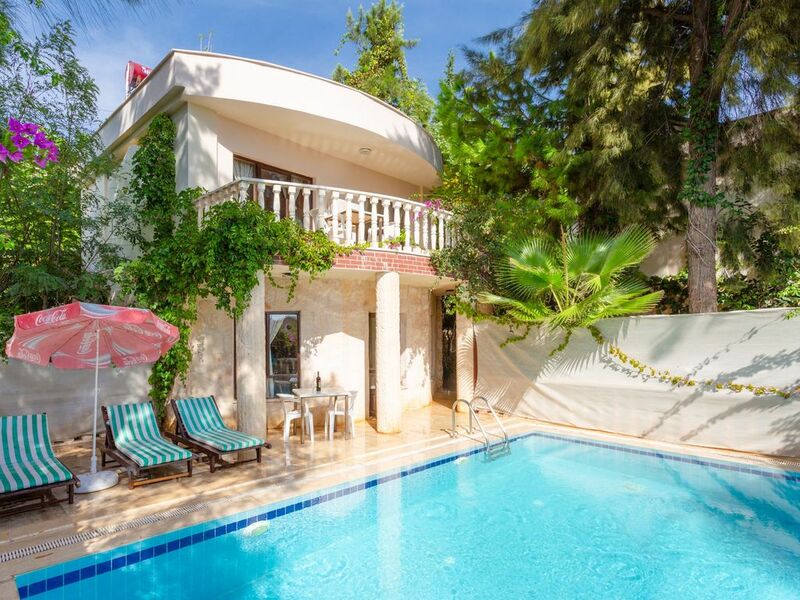 Villa Daisy is situated in Kalkan, Turkey. Our holiday rental property sleeps up to 5 people. Villa Daisy has has 2 air conditioned bedrooms. If additional beds are required there is 1 folding bed and 1 double sofa bed. The villa can sleep up to 5 people. Both bedrooms have en suite shower rooms, whilst downstairs is a further cloakroom with lavatory and washroom. The lovely private pool is in front of the villa. Between the two is a covered veranda and to one side an open sun terrace. Sun loungers, parasols and garden dining furniture are available to use in either space. Whether you are a sun seeker or prefer to stay in the shade there is an outdoor space here that is just right. Size: 8m x 5m There are sun beds and umbrellas provide around the private pool. • You can request to 'Place A Hold' for 48 hours while you decide. • Payments by Credit Card (Visa/Mastercard/Amex) or Bank Transfer. • 20% Deposit required to secure booking. • Rental Rates include all local taxes, utility bills and final cleaning. No additional fees to pay when you leave. • Maid Service, Laundry and Towels included within rental rates. • No breakage security deposit required. Instead, 5 Euro charge per person for a BDW (Breakage Damage Waiver) to cover any accidental breakages is charged. • Please Note - No smoking inside the property. • Rental durations less than 7 days considered if it fills a gap.